Connect your laptop’s external video connector to the video projector. You can use either the S-video or external monitor port. You can do this with the laptop on or off, though eventually you do need to turn it on. Connect the laptop’s audio-out port to the projector or to the location’s sound system. As long as you’re connecting things, see whether you can plug the laptop into an AC socket. No sense in wasting battery power for a presentation — or running out of battery juice in the middle of a presentation! In Windows Vista, open the Personalization icon in the Control Panel, and then click Display Settings. Or in Windows XP, open the Display icon in the Control Panel, and then click the Settings tab. 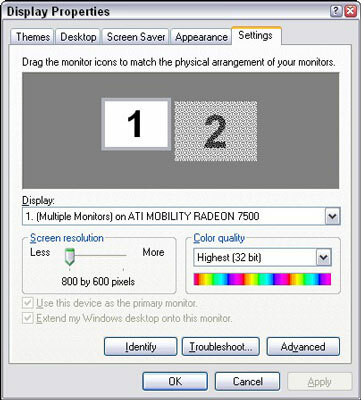 The job of the Settings tab, shown here, is to confirm that your laptop’s hardware is working and that it recognizes the external “monitor” as the video projector. For most modern laptops, this happens automatically; the only time you really need to use the Settings tab in the Display Properties dialog box is when things are hinkey. This laptop is ready to make presentations. Check the image; preview the slide show. At first, the projector may just show your laptop’s Windows desktop. That’s not why people are coming to the meeting, though. Take your presentation for a “pre-run,” with sound effects if applicable. 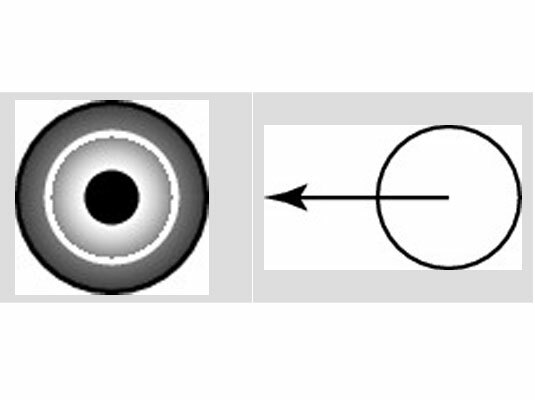 Load that main slide and ensure that it shows up on the screen. If so, you’re ready to go. Close the laptop’s lid, and go mingle or sit and wait to be introduced. You can leave your laptop at the podium, lid closed, ready to go. When you open the lid, the presentation is ready to run.